GL. Bajaj Institute of Management and Research, Greater Noida organized its 8th Annual Convocation for PGDM batches 2014-16 & 2015-17 on June 03, 2017, Saturday which witnessed the presence of Dr. R S Khanna, Chairman, Kwality Limited, Delhi & Mr. Ramesh Agarwal, Chairman, Agarwal Movers & Packers along with Mr. Pankaj Agarwal, Vice-Chairman, GL Bajaj Group of Institutions and Dr. Urvashi Makkar, Director General, GLBIMR. After the graceful Academic Procession ceremony, Mr. Pankaj Agarwal declared the convocation open and extended warm welcome to the eminent guests, followed by the Anuual report by Dr. Urvashi Makkar and Convocation addresses by the guests. Mr. Pankaj Agarwal highlighted the importance of value based education and work ethics in a cut-throat corporate setting. Dr. Makkar emphasized that, learning is a life long process and it never stops, she urged the students to work hard & strengthen their base while venturing out for their professional life. While sharing all the achievements of the Institute, she also highlighted the excellent 100% placements of PGDM Batch 2015-17. 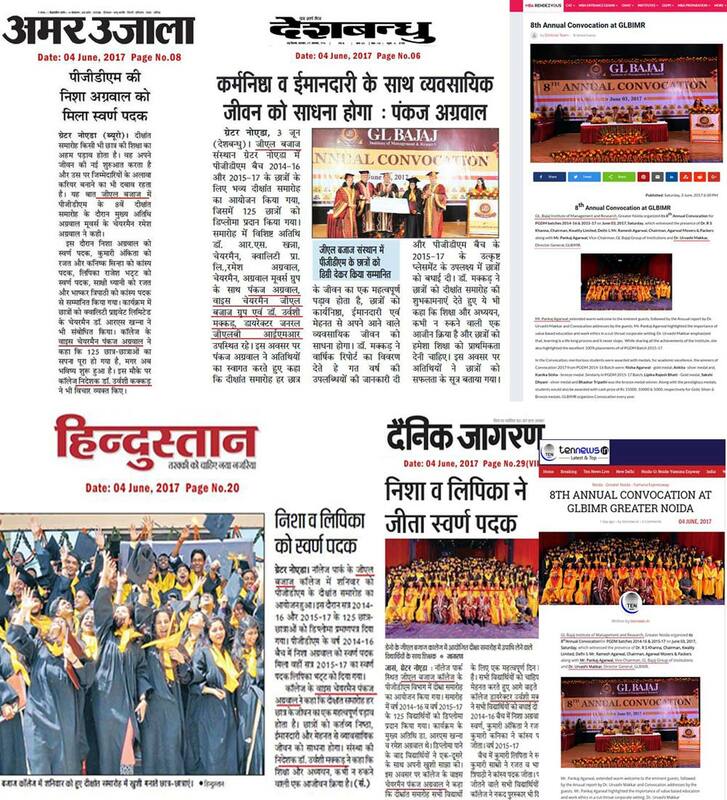 In the Convocation, meritorious students were awarded with medals, for academic excellence, the winners of Convocation 2017 from PGDM 2014-16 Batch were: Nisha Agarwal - gold medal, Ankita- silver medal and, Kanika Sinha - bronze medal. Similarly in PGDM 2015-17 Batch, Lipika Rajesh Bhatt - Gold medal, Sakshi Dhyani - silver medal and Bhaskar Tripathi was the bronze medal winner. Along with the prestigious medals, students would also be awarded with cash prize of Rs 15000, 10000 & 5000, respectively for Gold, Silver & Bronze medals. All the graduating students were than awarded with the diploma for the successful completion of their PGDM program. Highlights of the event also included power packed convocation addresses by the distinguished guests, Dr. Khanna shared the importance of “dedication & determination”, while Mr Agarwal left the audience awestruck with snippets of his life journey. He urged the students to take ownership in whatever they do and contribute to the society, while excelling in life, as it will come back to them manifolded. The successful organization of 8th Annual Convocation would remain in the memory lanes of the awardees forever.